The EN ISO 6940 and 6941 tests are extensively applied throughout industry, especially in the textile and apparel manufacturing industries, where it is widely used for the testing of fabrics and other woven material products. The test measures the rate of flame spread for vertically oriented samples. 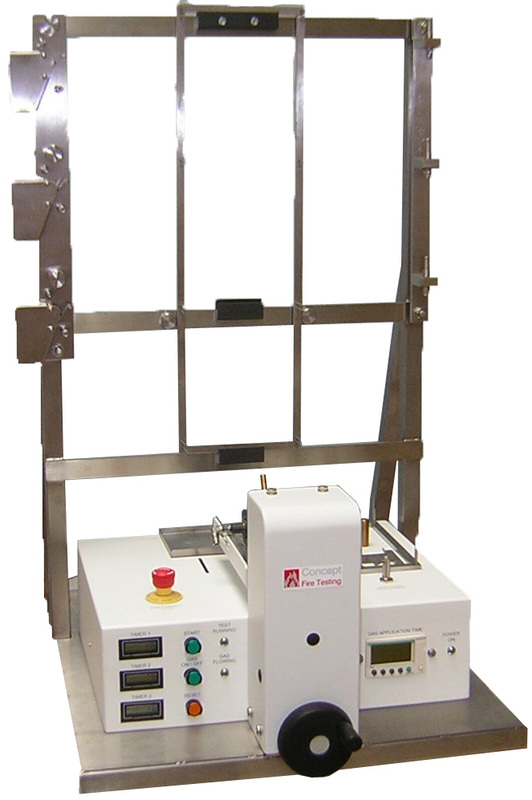 This new EN71-2 Toy Testing Apparatus available from Concept Equipment utilises modern technology and has been designed with ergonomics in mind to ensure that testing is as user friendly as possible. Standard equipment complies with the mandatory requirements of EN ISO 6940 and 6941 standards. Other test methods can be performed on the apparatus, such as the BS 5867/5438 series of tests with the addition of additional templates and sample holders. Gas Supplies: The preferred fuel gas used in the test is propane. Butane or a mixture of both is acceptable according to the test standard. The pressure required to obtain flame stability at 30° needs to be between 10 kPa and 50 kPa. No other restrictions should be used as this will reduce the flow rates.